All this current weekly grocery shopping is really too much on my soul, ladies. A few weeks ago we were going to dedicate an entire day to once a month shopping so we could be done for October. We instead spent most of our energy, along with several hours of our time, at Home Depot gathering project supplies for our DIY house projects. At the time, I was so excited about putting our house on the market, that I wasn’t thinking clearly. 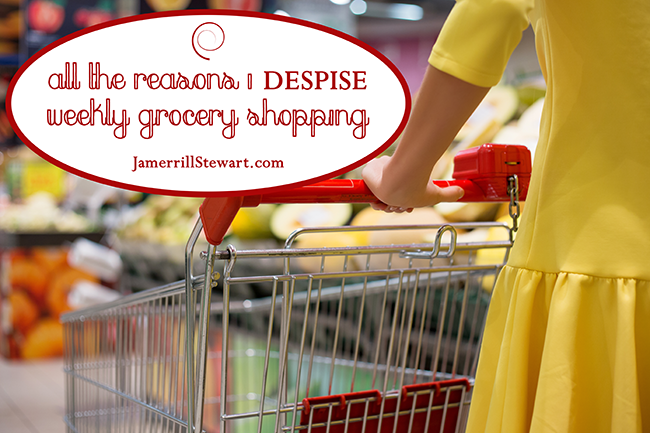 Along with adding major home repairs to our already busting to-do list, I’ve also added in weekly grocery shopping. 1.) Unorganized Mess – I’ll just come out and say that I feel fairly organized, planned out, and better able to manage our growing household when I already have everything I need in our house via once a month grocery shopping. 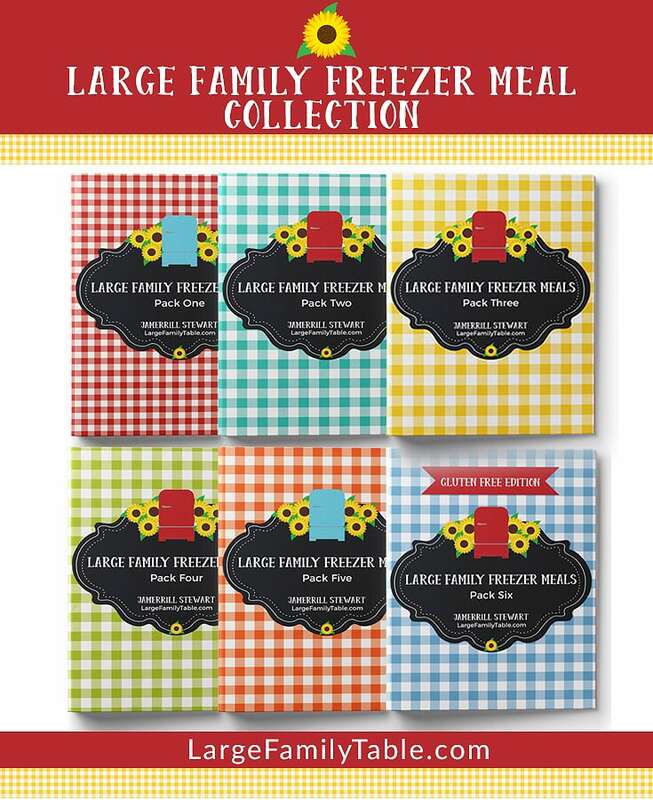 I’ve been shopping this way for years and it has yet again proved to be the most effeicant way for me to plan out and manage our 84 monthly meals + snacks for my family. I’m sure if I had been shopping weekly for years I would have a better system down. Right now I’m finding myself making multiple lists, still forgetting needed items, and having meal plans fall apart. Don’t get me wrong. When I lived in an urban city near the beach, my little toddler and I enjoyed our weekly trip out to the grocery store. Later my little toddler and I enjoyed our “shopping day out” which also included a new baby brother and a trip to story-time at the library. Fast forward over 15-years and this house is busting at the seams. 7 children. 1 husband in college full-time. 1 house getting put on the market. 1 frazzled momma who also works part-time running a full-time business. And yes, homeschooling. You’re just shaking your head saying, “Jamerrill, get yourself to a store for your once a month grocery shopping and chill-out!” Don’t worry friends, it’s coming. The weekly grocery shopping apocalypse is about over. 2.) Time Wasting – I’m wasting so much time that I’m not use to wasting. I’m wasting time making a new list each week. I’m wasting time by making a meal plan and forgetting needed items at the store. Last week I was making a big stock pot of homemade chili and realized I forgot crackers. Travis took me to our local store for crackers. While I was there I also picked up some other items I had forgotten in my previous One Week Large Family Walmart Grocery Haul. Additionally I loaded back up on yogurt since the kids had already ran through that. This week I already see that I don’t have a collection of hard and soft taco sells in the pantry. I totally missed those on my Costco Haul. So, guess what? Mr. Travis will have to make another quick grocery run for those and I’m sure I’ll add in a few more items to that list. 3.) Money Wasting Momma – Go grab it. MoneyWastingMomma.com. It’ll be all the rage and I’ll be sure to guest post about my weekly grocery shopping mishaps because I’m surely stacking those up high. Not only am I wasting my time as mentioned repeatedly above, I’m wasting money. Left and right, I’m dishing out money or swiping my bank card. Totally off of my cash based grocery budget at the moment. There are times when sanity is more valuable than money. For me my time is more valuable than money during this season (especially since any “free-time” I may have goes into running FreeHomeschoolDeals.com, etc). I like to stick to our large family grocery budget which is already as high as a mortgage payment, although when I’m on budget it breaks down to about $27 per person each week. But running into the store weekly I’m finding I’m quickly adding in this or adding in that. I find I quickly over spend by shopping weekly. It’s grocery shopping sin, I tell you. These are the main reasons why I really despise weekly grocery shopping. This momma just doesn’t have the time to shop weekly over and over again. When I once a month grocery shop I’m able to meal plan the entire month, write out a detailed grocery list (one time), and manage each and every penny by sticking to my cash based budget. Right now, I’m a crazed woman hoping to pull it together soon. What are your thoughts? Do you have a good system down for weekly shopping? Share any tips with me because I believe it’ll be another 2 weeks or so until I can do a massive once a month grocery shopping haul. 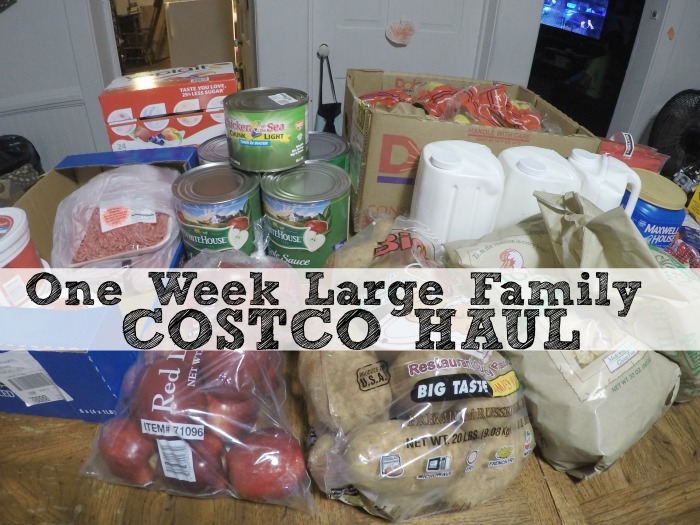 CLICK HERE to watch the full one week large family costco haul video! I watch your videos often with my four littles (soon to be 5 kids 5 and under) and I see that ya’ll go through a TON of yogurt just like us. I began making my own yogurt three years ago and haven’t looked back. Crystal at MoneySavingMom has a SUPER simple tutorial that spells it out. Then you can add in strawberries, peaches etc. and you cannot beat the price! We put our yogurt in the small 4oz. Ball jars and they are ready to go when the kiddos get to hankerin’ for a snack. Saves me a ton and it is so much healthier. You know, when I was 9 months pregnant I found your youtube channel and watched every one of your grocery haul videos. Then the baby came, we had coincidentally just gotten a costco membership, and we haven’t been weekly shopping in the five months since. I learned how to monthly shop from you. I’m getting better at it every month, but this month I lost the extra pair of hands I needed to hit both of my two stores, and as a result I’ve been in the store four days in a row getting all the extra bits and bobs I still needed. I agree that monthly shopping saves so much time, and I think a big reason is that when you do it all in one day you keep your eyes on the prize! Even waiting until the next day made me scattered as all get out. Our family does “every 2 week shopping haul”, which works out great and keeps us on budget. I love reading your blog and watching your videos. They are helpful! Thanks for sharing.